NEW Look, Size and Price! More than just an ordinary bath salt, our signature Spa Salt blends are a three-part synergy, combining the soothing power of ancient, mineral-rich sea salts with the healing properties of select organic herbs, and the physiological benefits of pure, aromatherapy-grade essential oils. Enjoy the uplifting, energizing and cheerful blend of Organic Grapefruit and Mint whenever you need an infusion of energy or a refreshing bathing retreat. Great for summertime, or a morning booster, Grapefruit gladdens the heart while Peppermint stimulates and refreshes the skin. 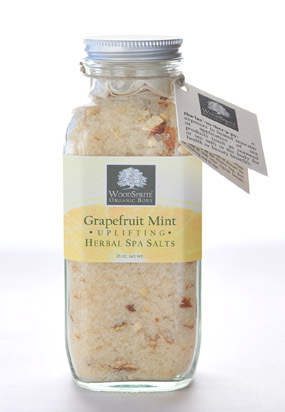 How to Use: Add 1/4 to 1/2 cup of salts to muslin bag (included), tie tightly and toss into full tub, then slip into bath and let Grapefruit-Mint energize your soul. *Hint- Use the herb-filled bag to cleanse your skin and squeeze out the full benefit of the organic healing botanicals! Ingredients: Sea Salt, Epsom Salt, Dead Sea Salt, *Organic Grapefruit Peel, *Organic Lemon Peel & Pure Essential Oils of *Organic Grapefruit, *Organic Sweet Orange and *Organic Peppermint. (*Certified Organic) 100% Natural. Non-foaming - Hot tub safe. Earn 26 Loyalty Points when you buy this item!